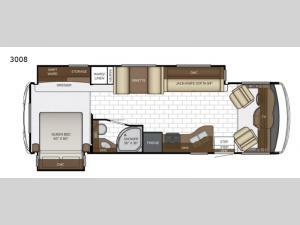 Come see just how fun and easy life on the road can be when you choose to travel with this Bay Star Sport 3308 class A motor home! There is plenty of room and space from the full wall slide out along the roadside to all of the overhead cabinets. In the front there is seating at the driver and passenger seats since they swivel around, the 84" jack knife sofa, and the dinette. Both the dinette and the sofa can double as sleeping space, as well, there is a queen bed in the rear for mom and dad. The side aisle bathroom has a 36" x 36" radius shower plus overhead cabinets for your belongings, a sink, and a toilet!